Pretzel Logic's Market Charts and Analysis: Any Reasons to Get Bearish Yet? 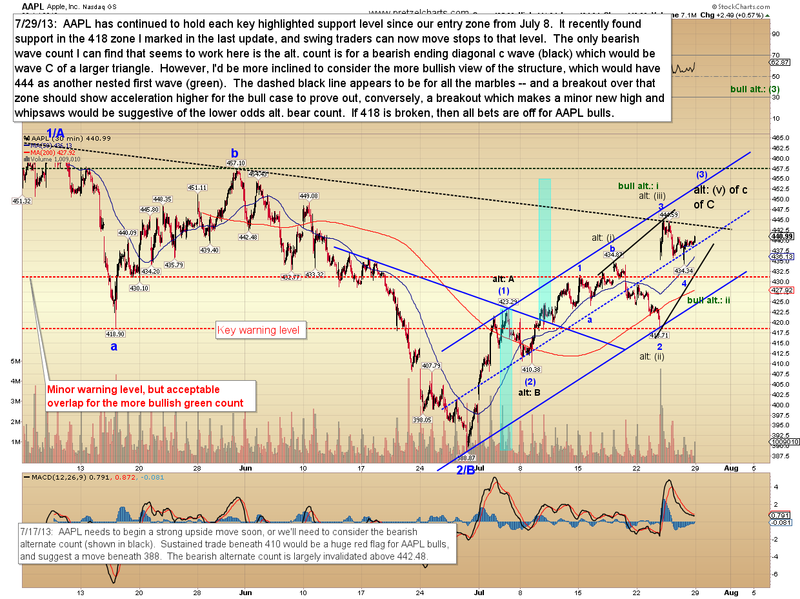 Any Reasons to Get Bearish Yet? 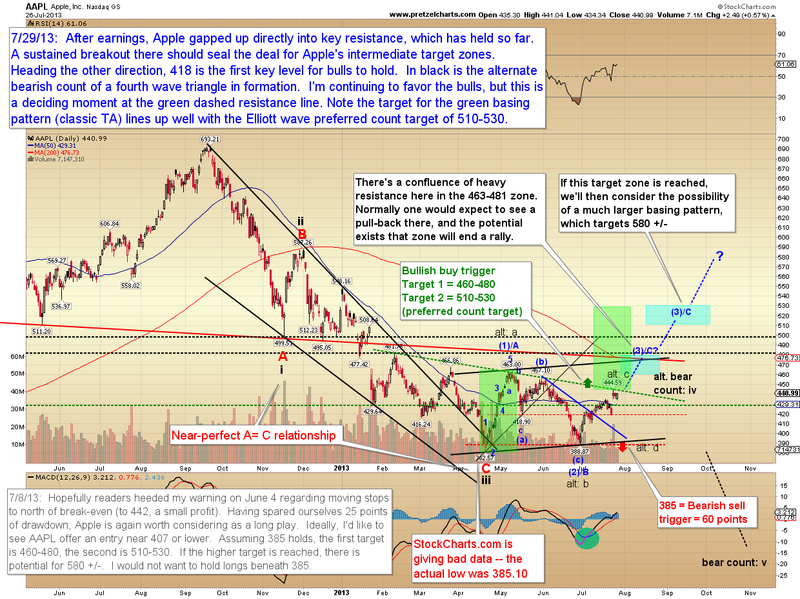 In this update, we'll revisit Apple (AAPL) and see how the wave count is progressing, and also take a look at the broader market. Before I get too far, though, I should mention that since I reside in Maui, I may end up "off the grid" in the near future. We're awaiting the arrival of Tropical Storm Flossie, which is due to hit Monday morning and projected to pass directly between Maui and the Big Island of Hawai'i (this is a relatively narrow space, which means it's going to hit us pretty hard). In preparation, I spent yesterday braving the long lines at Costco in order to stock up on necessities like Doritos and Kit Kats, in case the storm wreaks havoc on Maui's infrastructure and leaves us without power and chocolate. Honestly, though, it's tough to take a storm named "Flossie" too seriously. To me, "Flossie" sounds like the name of a cheerful licensed cartoon character who promotes the virtues of good dental hygiene ("Remember kids, Flossie says to clean between your teeth after every meal! Especially after eating Kit Kats and Doritos!"). Anyway, last update noted that the S&P 500 (SPX) had reached the 1695-1705 target and was probably due a fourth wave correction. It appears that correction has unfolded, and is likely complete, suggesting the market is beginning wave (5) up to the 1700's. The decline appears corrective so far. The Dow Jones Industrial Average (INDU) put in a bullish reversal on Friday, and this type of candlestick suggests a lot of buyers were/are waiting just under current price levels -- which suggests solid price support for the near-term. 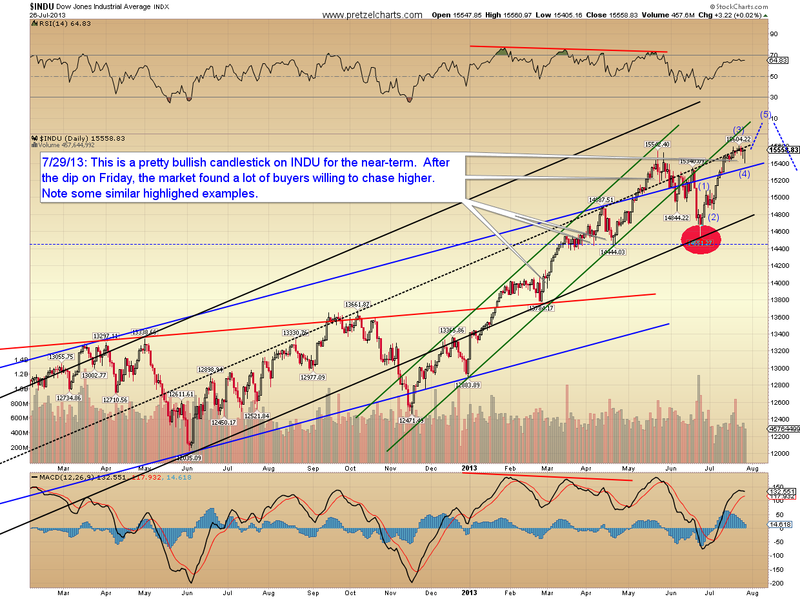 The Dow Jones Transportation Average (TRAN) presents an interesting picture. It's formed enough squiggles for Minor Wave v to count as complete, but wave v would appear disproportionately small if it is indeed finished. One of the guideline of Elliott Wave Theory is two waves in an impulse tend toward equality -- usually wave i and v. If we've only seen wave (1) of v, then there's quite a bit more rally still to come. Apple has reached a larger inflection point. It appears to be consolidating under a major resistance level. 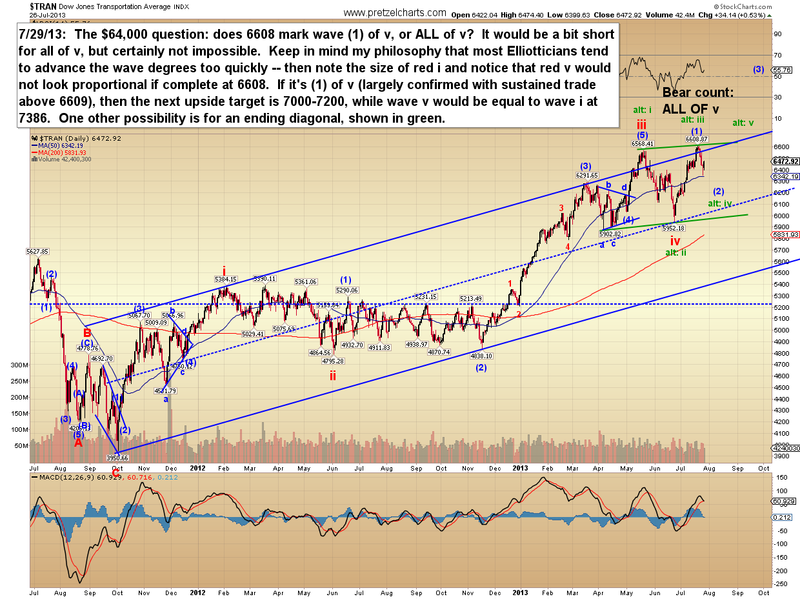 If my preferred wave count is correct, it will ultimately break out over resistance and make a run at the 500's. 418 is now the first key level for bulls to hold. There are still bearish options, but they presently appear to be lower probability. Again, 418 appears to be the first key downside level to begin shifting odds to the bears. In conclusion, Friday's market found strong support, which suggests that bulls are still in control for the time being. 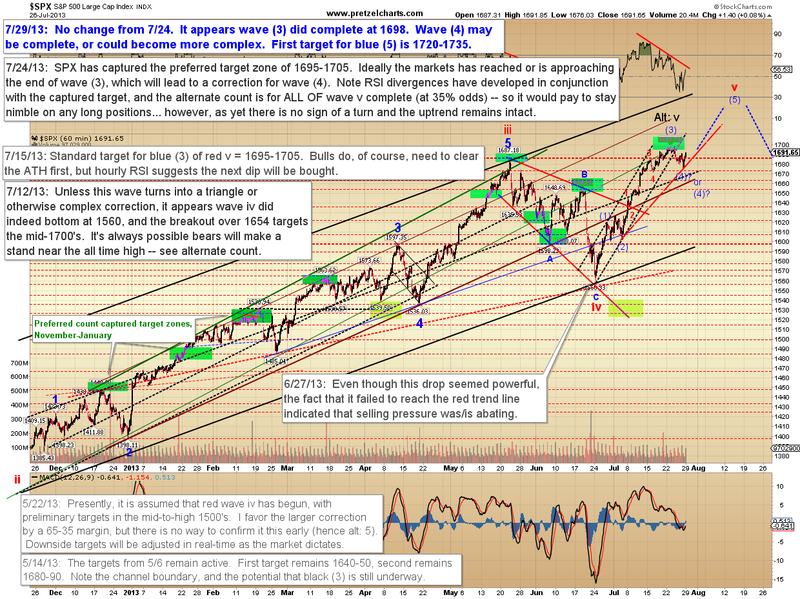 The next upside target for SPX is still the low-to-mid 1700's. I do still expect we're completing a fifth wave at multiple degrees, and that a larger correction will follow -- however, TRAN will need to be watched carefully for signals that the picture could be even more bullish than expected. Trade safe.